SEOUL – On September 1 a group of seven pilgrims left Bunwhang-sa temple in Gyeongju to re-enact the famous journey the Korean Buddhist saint Wonhyo made from Gyeongju to the area of Wonhyo-bong more than 1,300 years ago. This is the second Wonhyo pilgrimage. 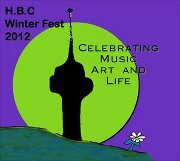 The first one, an exploratory trip, took place in December of last year. In that journey, the pilgrims covered just shy of 500 km, much of which was walked along back roads and mountain tracks. The journey took them from Gyeongju, ancient capital of the Korean Shilla kingdom, to what is known as Wonhyo’s cave near Dangjin, on the west coast of South Chungcheong Province, just south of Incheon. The second pilgrimage is expected to finish in the same place. Cheongryang-sa temple in Cheongryang-san Park shot during first pilgrimage. Wonhyo’s journey resulted in his enlightenment. Legend has it that he and fellow spiritual seeker Uisang, took shelter from a storm in an old tomb they thought was a cave. During the night Wonhyo became thirsty and began searching on the ground for a gourd of water. He found one and picked it up and drank deeply from it. The water was sweet and refreshing and he slept deeply until dawn. In the morning he discovered that the vessel he had drunk from was not a gourd but a human skull. It was not filled with sweet, clean water but instead was full of dirty rainwater, rotting meat and maggots. He was so revolted by what he had drank that he fell on his knees and vomited. At that moment, the question came to his mind “Why? Why was the water so sweet and refreshing in the night and yet so revolting in the day?” The answer came to him that it was his mind that determined the difference between the water at night time and in daytime, not the water itself. He realized that truth is created by the mind. At that moment, he attained enlightenment. 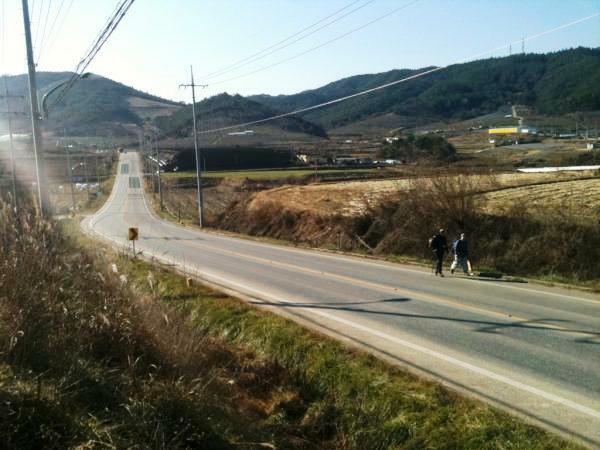 Entering Jinbo, 16 km from the day's destination during the 2011 pilgrimage. 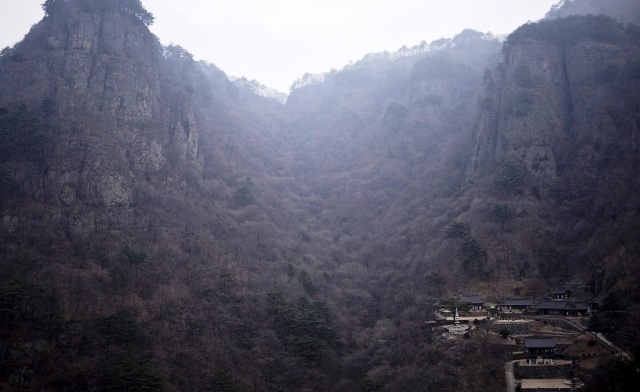 On the first pilgrimage, after their arrival at Wonhyo’s cave on December 18, the pilgrims celebrated the saint’s enlightenment by drinking pure spring water from vessels they took to the cave during a brief ceremony. The cave, he said, is an unpretentious place, a dark hole gouged into a huge rock, a good place to shelter from rain but not a comfortable place to spend a night. It was once venerated as the home of a mountain spirit before Wonhyo meditated in it , after which it became a Buddhist shrine honoring him. The cave provided a symbolic end to the journey, he said, and was not the actual tomb where Wonhyo attained enlightenment, a spot about which there is no consensus. MacGregor thanked the Templestay Program and the Jogye Order for their help and cooperation with the project. 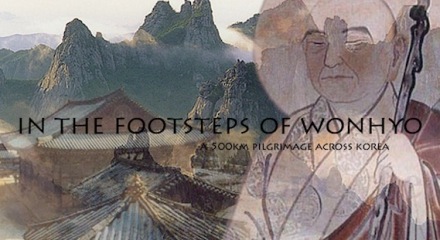 More information about the pilgrimage can be found at www.inthefootstepsofwonhyo.